Gregory Williams, Creighton Chandler and Catholic Worker Mark Colville were charged with trespass, obstruction of governmental administration and two counts of disorderly conduct. Colville was additionally charged with criminal contempt of court because he is one of the nonviolent activists previously issued an order of protection by the local Dewitt Town Court. After several hours in custody, the men were released on their own recognizance. Initially they were told by the police that they were going to be held on a high bail, but the judge decided differently. 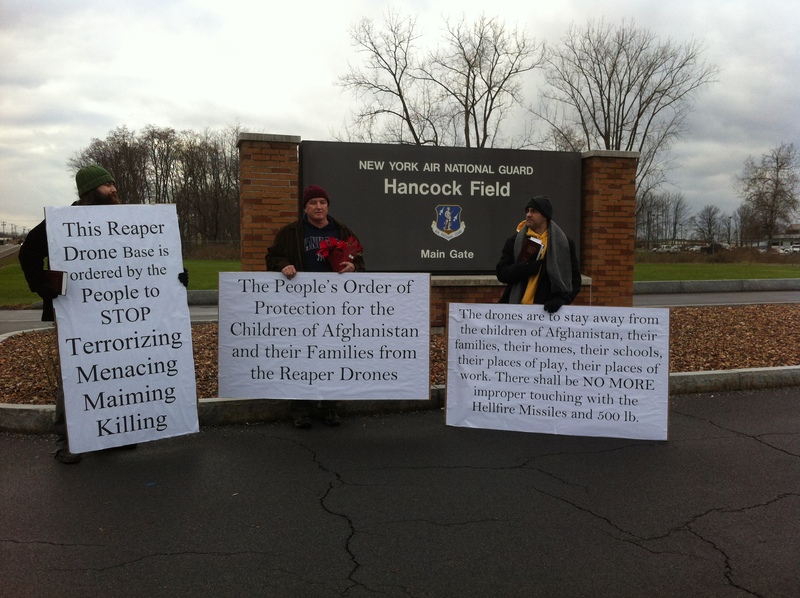 Since October 25, 2012, over 50 citizens have been arrested – and issued Orders of Protection – for protesting the killing of children by Reaper drones piloted from Hancock Air Base. The DeWitt Town Court has issued these orders at the request of Hancock Base Commander Col. Earl A. Evans. Such orders suppress the First Amendment right of all those arrested to petition their government for redress of grievances at Hancock. The grievance is that Hancock’s 174th Attack Wing technicians pilot weaponized Reaper drones over Afghanistan, engaged in the targeted killing of civilians. TO: President Obama; The United States Military; Col. Greg Semmel; Col. Earl Evans; The 174th Attack Wing of the Air National Guard. Assault, stalking, harassment, menacing, bombing, killing, maiming and terrorizing, criminal obstruction of breathing or circulation, disorderly conduct, criminal mischief, forcible touching, intimidation, threats or any criminal offense or interference with the victims of the alleged offenses perpetrated by the offenders named in this order. There shall be no more improper touching of the Children of Afghanistan or their families with your Hell Fire missiles and your 500 pound bombs. There Shall be no more menacing and reckless endangerment of the children and their families. It is further ordered that this order of protection shall remain in force forever. Failure to comply with this order will result in the people’s continued nonviolent resistance to this illegal and immoral behavior. And further please see attached plea from the people of Afghanistan making this request. ORDER personally served at the gates of Hancock Air Base, site of where war crimes are being committed. On Friday, the 30th of May, 2008, my brother-in-law was killed by a drone along with four of his friends. My brother-in-law was a student and was innocent. Accountability from the U.S. military for this incident was non-existent. The incident created a situation which was beyond imagination. It affected the minds of my sister and all members of my family. When my nephew was 5 years old, he asked his mother, “Where is father?” My sister replied,”Your father was killed by a computer” These negative effects on all of us persist till today. I am worried for my family and the people of my village. I request that U.S. courts protect my sister, my family and my village. I wish that U.S. courts will be able to save all of humanity from drones. Read an article at syracuse.com here.